The Chicago Lighthouse is a world-renowned social service organization that serves the blind, visually impaired, disabled, and veteran communities. 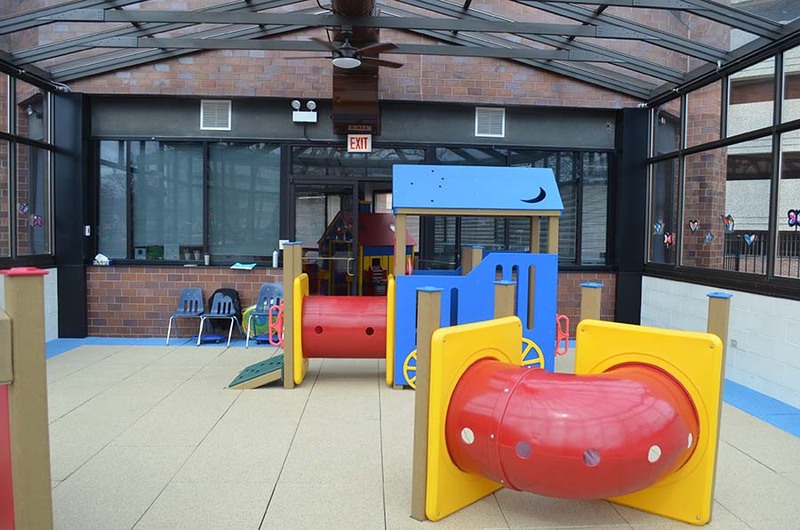 The Chicago Lighthouse wanted a safe, resilient, durable surface for their children’s solarium/play area, which was especially designed to accommodate youngsters who are blind, visually impaired or otherwise disabled. They chose our No Fault Safety Tiles that are perfect to use for both indoor and outdoor play areas. We’ve written before about the importance of accessible and inclusive playground design. Today we’re going to discuss the importance of including children who are blind or visually impaired in your plans to build a better playground. Playground planners who want to consider the needs of visually impaired kids don’t often know where to start. They don’t know how to make the play experience open to everyone. All too often, they assume it will require expensive specialized equipment or that accommodations will somehow exclude kids who aren’t vision impaired. On the other hand, when playground designers adhere too strictly to the minimum requirements put forth by proponents of inclusive play, they may forget to emphasize the things that make great playground experiences to begin with – namely, that they be engaging, stimulating, and fun for all children. There’s no doubt that you can create challenging and creative playscapes that are accessible to children with disabilities (including the vision-impaired). You’ll also find that doing so isn’t incompatible with goals to create opportunities for play that benefit children of all abilities. For all children, playtime is crucial for the development of motor, social, and language skills. It’s also an important driver of good fitness habits early in life. Too often, kids who are visually impaired do not experience the same opportunities for recreation enjoyed by their sighted peers. Here are a few pointers to turn that trend around on your playground. Make play “hands-on.” Remember, blind and partially sighted kids “see” with their hands. Tactile elements will help the child get a sense of “place.” For example, one mom incorporates braille signs on her sons’ playground equipment. Consider using grooved surfacing to help kids find their way around. Rubber timbers with rounded tops can provide extra safety and path-marking. Set boundaries. Make sure the perimeters of the playground are easy to find. It’s a good idea to have the entire playground area “fenced in” for safety reasons. However, some blind children like to “trail” along the inside of a fence, too. So here you have an opportunity to “dress up” the inside of the fence with things for them to explore through touch. Incorporate sound. Remember: Great playground design appeals to all of a child’s senses. Musical instruments and other auditory stimuli are an excellent idea for an accessible playground. These days you can get beeper balls, balls with bells, goal locators with sound, and other adapted play equipment that can make playground time more accessible to children with visual impairments. If that’s beyond your budget, permanently installed, percussive musical instruments can mount onto existing play structures. Not only are they fun to play, but their locations can also create audible landmarks for kids as they familiarize themselves or travel from one play area to the next. Use visual clues. Don’t forget to accommodate vision-impaired children who have some ability to see. For example, bright yellow tape might clearly mark the edges of steps and anywhere else a child can accidentally step off. You may also consider painting playground equipment in bright colors that make it easier for kids with low vision to identify from a distance. Buddy up! When it comes to more risky play (such as running), blind kids can partner with a sighted “buddy” to guide them safely on the way. For more independent runs, some schools use a guide wire or rope system (in which a child is tethered to a guiding line). A stationary noise at the “finish line” can help kids orient themselves and give them something to run toward. The barriers that children with disabilities are confronted with daily should not prevent them from engaging in playground activities. Schools and local communities are responsible for making play areas available to all – doing so may simply require some creativity and community input. No Fault Sport Group can help you create an inclusive play area that emphasizes safety, inclusion and value. Please contact No Fault Sport Group today, and let us know you read our blog!